Michigan State's Miles Bridges dunks for two of his 23 points. 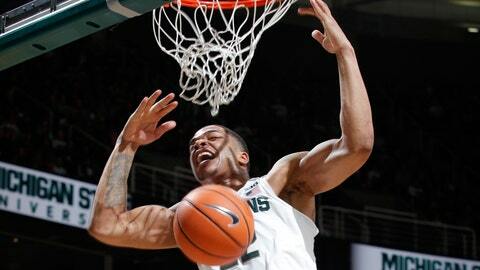 EAST LANSING, Mich. (AP) — Tom Izzo sat Cassius Winston at the beginning of the second half, benching his point guard to send a message. “We’ve got to figure out a way to bring it from the beginning,” said Walton, adding Izzo’s move motivated him to play with more intensity.